Death metal that is both clever and varied without losing any of the aggression that is essential to the genre is hard enough to come by these days. That is exactly why it is good to have albums like Sisters Of Suffocation’s sophomore album ‘Humans Are Broken’ every once in a while. The music is complex, but not showy or hard to follow and while there are plenty of melodic touches and unexpected twists to surprise the listener, Sisters Of Suffocation never forgets the importance of brutality. ‘Humans Are Broken’ sets the bar pretty high for death metal in 2019. Prior to the recordings of the album, Sisters Of Suffocation went through a couple of line-up changes. These changes have certainly had their effect on the outcome. New drummer and lone brother Kevin van den Heiligenberg makes his presence known through his powerful and varied drumming – you will never hear him play the same type of groove for too long – as well as his explosive and surprisingly natural drum sound. In addition, Emmelie Herwegh joined as a second guitarist, causing fellow axewoman and main composer Simone van Straten to really run with the idea of having two guitars. There are significantly more solos and harmonies here than on ‘Anthology Of Curiosities’ two years ago. Another big plus about ‘Humans Are Broken’ is the amount of variety in material. Sisters Of Suffocation really explores all corners of death metal here, from the almost Bay Area thrash metal nature of the riffs in ‘What We Create’ right down to the subtle nods to black metal in more atmospheric tracks like ‘Liar’ and ‘The Next Big Thing’. Vocalist Els Prins has a few melodic outbursts here and there, but the music never veers into full-on melodic death metal or wimpy metalcore territory. Check out ‘The Objective’ for an example; the song is full of melodic guitar and vocal work, but the intensity does not let up for even a second. Of course, anyone looking for a punch in the gut is served well by ‘Humans Are Broken’ as well. The absolutely annihilating main riff to ‘Blood On Blood’ will do just that and despite its progressive nature, there is plenty of pummeling riff work in the ‘Souls To Deny’-era Suffocation-esque ‘The Machine’, as well as what is probably the strongest guitar solo on the album. ‘Wolves’ packs so many ideas that it’s almost impossible to believe that the track is only three minutes long. And yet, the song never becomes disjointed, instead opting for a dark, immersive atmosphere. 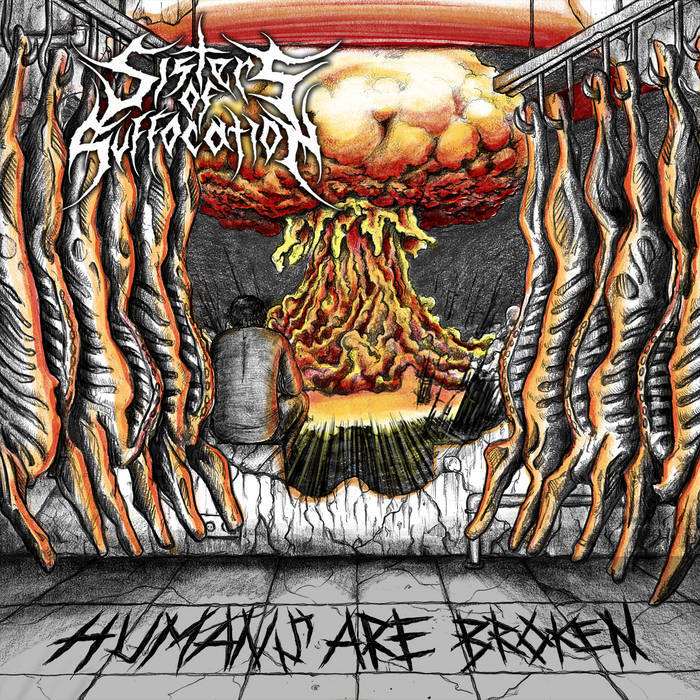 While many younger death metal bands are trying to adhere to a certain trend or style, the main concern of Sisters Of Suffocation seems to be to write a good song and perform the hell out of it. And that is exactly how it is supposed to be. For some fans of certain subgenres within death metal, ‘Humans Are Broken’ may be too little of “their” thing, but really, everyone who likes their death metal interesting, slightly technical and somewhat melodic, the album is a must. If this line-up manages to stay together, I cannot see anything standing in the way of a bright future for Sisters Of Suffocation.